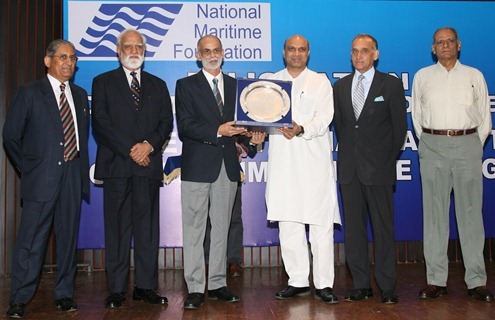 The first ever Maritime Achievement Award was presented to Commander Dilip Donde of the Indian Navy, in New Delhi on September 16, 2011 by the Minister of State for Defence, Dr. M.M. Pallam Raju. This award was presented during the felicitation function to honor Commander Dilip Donde, the first Indian Sailor to successfully complete a solo circum-navigation of the globe. Commander Dilip Donde commenced his solo circumnavigation voyage in INSV Mhadei from Mumbai on August 19, 2009. During the solo circum-navigation, he unfurled the national flag on his 56 feet yacht INSV Mhadei, on January 26, 2010 (60th Republic day of India) at Port Stanley, Falkland Islands. Returned to Mumbai and completed the solo circum-navigation of the globe on May 22, 2010 in the presence of Vice-President Hamid Ansari and Navy Chief Admiral Nirmal Kumar Verma. Here is the photograph released by the Press Information Bureau. The Minister of State for Defence, Dr. M.M. Pallam Raju presenting the award. Vice Admiral (Retd) Pradeep Kaushiva – Director NMF, Vice Admiral (Retd) MP Awati, Admiral (Retd) Arun Prakash – Chairman NMF and Admiral (Retd) V.S. Shekhawat are also seen.